Here’s a thought on how memories and thanks can help us thrive in the rapid change ahead. Let’s be thankful for so many who have given so much, so many times. Let’s use these memories and gratitude to make a future that these sacrifices deserve. However, there is no magic bullet that helps us learn from memories that create thankfulness… but this one comes close for me. My father was in the Seabees during WWII in the Pacific theater. The Seabees are the Construction Battalions (CBs) of the United States Navy so he was in several island invasions and was wounded by a Japanese sniper during the invasion of Iwo Jima. The bullet above passed through my dad’s leg giving him a partial disability. For this he received a check from the VA each month for about $35. In the 1950s and 1960s, this would buy more than a few cups of coffee. Having grown up in the depression of the 1930s, my dad was fanatical about job security so he worked for the City of Portland first digging ditches… then as a zoo keeper and finally working his way to being associate director at the Portland Zoo. He really rose in the ranks considering he never finished grade school. He studied at night, obtained his GED and then went on to gain an Associate Degree from Portland State College night school. Yet that city job never paid really well. Unlike Federal workers in today’s world… city and state government employees then (and I believe now do tend) to sacrifice income for job security. This meant that there were times when that $35 kept the family going until the next paycheck. My dad was thankful everyday just to be alive. He was sort of thankful for the wound. I am really thankful the bullet did not hit two feet higher! My sister and I knew about all this wound, but I was surprised just this year when our son, Jake… who was visiting his grandmother in Portland… called and asked me about the bullet that was sitting in a display case at my mom’s house. 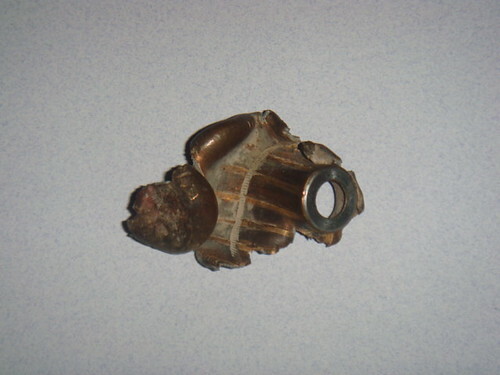 This was the bullet pulled from my dad’s leg. It had been kept in a display case in my folk’s living room for decades. Yet amazingly neither my sister nor I knew about it nor had seen that it was there. We were more surprised than Jake was. Every bullet has full potentiality… for rack and ruin or for a magical $35 (sorely needed) dollars a month. Our universal order seems to move itself along at an ever increasing pace. The Roman Empire lasted about 1,500 years, the Holy Roman Empire about 800 years and the British Empire 400 years. The attitude of Thankfulness keeps us in tune with the infinite intelligence that creates and connects us and focuses our awareness on the creative, positive, useful parts of our lives. We can be thankful to live in an era of such richness… of such awareness, diversity and material wealth and remember those who helped make the world this way. Yet a part of human nature resists change. Most investors and business people tend to hang on to old and out of date ideas, attitudes, habits and ways. This gives those of us who embrace “What is?” and “What is coming?” an advantage. We can be thankful for what we have… for what is coming and we can enhance our chances for success. We can treat each adversity with the same respect as our good fortune and let memories of sacrifice in the past guide us to a better future.